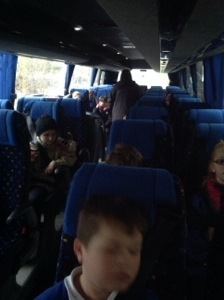 We have just changed over to a luxury coach after a minor setback, all the children are now really hungry and are looking forward to lunch. We can’t wait to get our first activity underway! Hi hasan, looks like u will be having so much fun! Hi 4G/4k is Luke and josh still singing with Mrs Kirby.Mrs Greenwood i was just wondering if you could send a few pictures of ilamhall for us to see. Hope you are all settled in now and have enjoyed your afternoon. Did you go orienteering? It is already so quiet without you all! I’m glad you finally arrived safely at Ilam Hall and hope you are enjoying orienteering! Don’t get too wet! Dear Y4 what a day you had – fabulous! I’m just packing for London, follow our blog too! Have a good rest and you too teachers, a big day tomorrow!